Friday afternoon, the student team of the Tsinghua University of Beijing, China was presented with the Best Design Award of the Form and the City Master Class at the Rotterdam Kunsthal. The team won the award with ‘New from Old’, a design for the Rotterdam Zuid Maashaven silo. During the Master Class over 60 students from around the world designed eye-catching buildings for Rotterdam Zuid. The students assignment was to design a building powerful enough to change the surrounding city and community. 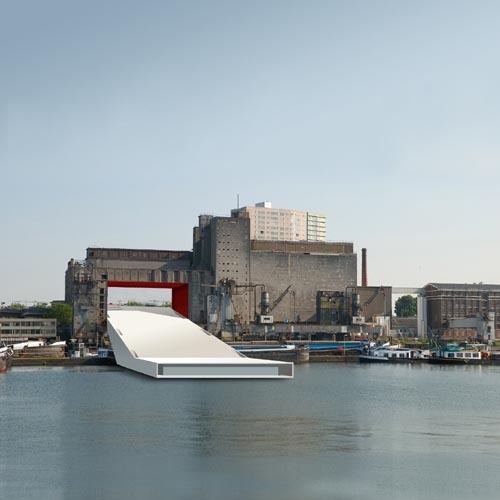 The students designs will be a source of inspiration for the Rotterdam Zuid Pact that backed the Master Class. The Pact is a joint new investment programme of local authorities, municipal districts and housing associations in Rotterdam Zuid. The design by the Tsinghua University students enhances the historical and industrial charm of the former grain silo by adding a powerful new volume. Their proposal is to create a large rectangular opening in the building with a large, slanted plane through it. The plane connects Maashaven Metro Station with Maashaven harbour, where it ends in a multipurpose pontoon. The eye-catching plane is also the roof of a building that contains a shopping centre, galleries and a party hall. The grandeur of the design turns this new urban venue into a landmark. The participating students were Xia Guo Fan, Gu Jun, Tang Yang and Zhang Ye. Their supervisor was Brian Chang. The Rotterdam Berlage Institute team won 2nd prize for Civic Interlock, a design for IJsselmondes Groene Tuin. The team from MIT (Cambridge/Boston, USA) won 3rd prize for Outline of the Core, a project for the Slinge Metro Station. Master Class jury members were chairman Vedran Mimica (Berlage Institute), Christine de Baan (IABR), Mauro Parravicini (OMA), Michelle Provoost (WiMBY!/Crimson), Karin Schrederhof (Rotterdam Zuid Pact) and Oliver Thill (Kempe Thill Architects). Exhibition Master Class Form & the City. All of the 14 designs are exhibited on the top floor of the municipal district office of the municipality Feijenoord Paul Krugerstraat 181, Rotterdam through 30 June. Admission is free. Tuesday – Saturday 10.00 a.m. – 5.00 p.m. Sunday 11.00 a.m.-5.00 p.m.